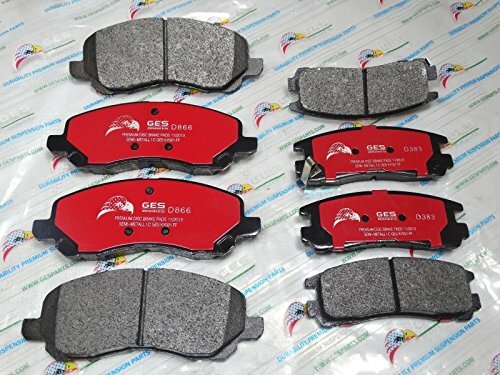 NEW 2 Sets Front & Rear Brake Pads Mitsubishi Eclipse Galant D866 & D383 by GES PARTS at Got Busted Mobile. MPN: D866D383. Hurry! Limited time offer. Offer valid only while supplies last. GES Brakes One Year Warranty 1 x Front Brake Pads1 x Rear Brake PadsLEFT + RIGHT2 SETSFitting and bedding un procedures for asbestos free brake Pads. Fitting and bedding un procedures for asbestos free brake Pads. The Product Function Matches The GB5763- 98, German TL- 110, PV- 3211 Etc. Standard Completely. The Friction Material That GES PARTS Produce, Have The System Move The Function Sta- Bility And Bear The Friction Good, And Have No Noise, And Free From Pollution Advantage Our Product Had Passes ISO9001: 2000. With The High Poit Of Departure, High Technique, High Quality, Solidify Of The Creative Develop Strategy For Struggling, Civilization TrustWorthiness Offer Creative Off Road, Development Strategy, GES PARTS Come Out To Technology Creative Off Road.